To develop and formulate high efficiency paper processing solutions is the main objective of Leizhan engineer and professional technical team. 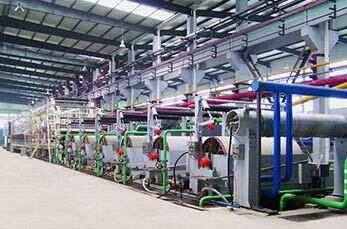 Leizhan paper production project can provide customized solutions to meet various demands for paper mill. Leizhan 3600/500 fluting paper machine is to produce 190 tons of fluting paper per day. With a design speed of 500m/min and basic weight of 90-160g/m2, Leizhan waste paper recycling paper machine can produce a grade fluting paper by using 20% AOCC and 80% OCC as raw materials. The production devices used in the fluting paper processing system contains air cushion headbox, wet end, Vacuum device, suction press, double blanket roller press, dryer cylinder, sizing machine, and reeling machine. Dryness of sheet after wet end reach 20%. After pressing, dryness of sheet over 43%. The shrinkage of sheet The shrinkage of sheet in the dryer section less than 4% and the dryness of end products can up to 92%. Leizhan provide complete sets of life-cycle services to papermaking plant. What’s more, Leizhan engineers available to go the customers’ site to instruct the project containing engineering, installation, commissioning, and start-up of paper mill.